When life throws curve balls at good people....good people respond. Here are some of the recipients of our donations. I met Chris about six months after he was injured in a skiing accident which left him paralyzed from the waist down. Shake-A-Leg, a second phase rehab program for spinal cord injured, was our common ground where Chris was a participant and I was house photographer. We became fast friends and often trained together for upcoming road races. Chris learned that his new definition of running now meant "to push" and with sheer determination he pushed and pushed and pushed some more. Then one day Chris hit his stride....that moment all runners hope for when something clicks and going one more round is not necessarily easy but clearly is easier. As I watched my friend literally turn a corner and with a powerful push start up that steep incline one more time, it was apparent the athlete had resurfaced. As it turns out, I was witnessing the start of this man's incredible journey to becoming the most decorated mono skier and honored paralympian in the world. His determination to reach goals and to continuously look forward is truly an inspiration. It is a privilege for Just B-Cause / Solo Perché to be affiliated with Chris and his foundation "One Revolution." Carwile, Chris, Bernie and Chris after a Shake-A-Leg road race. She was surrounded by devastation but yet she smiled and graciously welcomed each visitor into what was her home for the next eight hours. At the entrance, a large glass jar held a prominent position available for passers by to easily drop spare change, dollar bills or an occasional five or ten. “St. Thomas was annihilated…as was St. John,” said Mary Dema, a native of Newport, RI and lifelong resident of St. Croix. Mary was visiting Newport when Hurricane Irma unleashed its fury leveling two of three of the US Virgin Islands. In a booth donated by the Newport International Boat Show, Mary spent the next three days as a volunteer advocate for the St. Croix Foundation which was established in 1990 after the island was destroyed by Hurricane Hugo. “The St. Croix Foundation knows what the immediate needs are for relief as well as the long term needs for restoration,” stated Dema. “This foundation will be instrumental in our neighbor’s fight to get back on their feet.” Ironically, several days later, both St. Croix and Puerto Rico were hammered by the wrath of Hurricane Maria in an unprecedented near tandem assault from two Cat 5 plus monsters. From Solo Perché/Just B-Cause, we send support and wishes to all our friends in the Caribbean for a quick and safe rebuild. May your shores return to the beauty known and loved world wide. Thank you for your support of the Alzheimer's Association The Longest Day. Your donation is appreciated now more than ever. Alzheimer's is an international epidemic. Across the world, at least 44 million people are living with Alzheimer's, including more than 5 million Americans. And Alzheimer's doesnt stop there. More than 1.5 million Americans are serving as caregivers for a friend or family member living with the disease. Your gift allows us to continue in our mission to eliminate Alzheimer's disease through the advancement of research; to enhance care and support for all affected; and to reduce the risk of dementia through promotion of brain health. Please accept our heartfelt thanks for your continued support. In the summer of 2002 local Newport sailor Robie Pierce had an idea and he approached Stephanie and Judy McLennan with the idea of organizing a sailing regatta for disabled sailors with the regatta also providing a clinic and much needed coaching for the athletes participating. The C. Thomas Clagett, Jr. Memorial Clinic and Regatta, was founded in 2003 and honors the late Tom Clagett (1916-2001), a U.S. Navy World War II veteran who learned to sail on the Chesapeake Bay. As a youngster he suffered temporary paralysis as the result of meningitis; it was an experience that left him with deep respect for the accomplishments of people with disabilities, especially athletes. The first clinic and regatta was held in Newport in 2003 with 5 boats taking part and in 2017 The Clagett will celebrate 15 years of providing disabled sailors with a clinic and regatta second to none around the world. 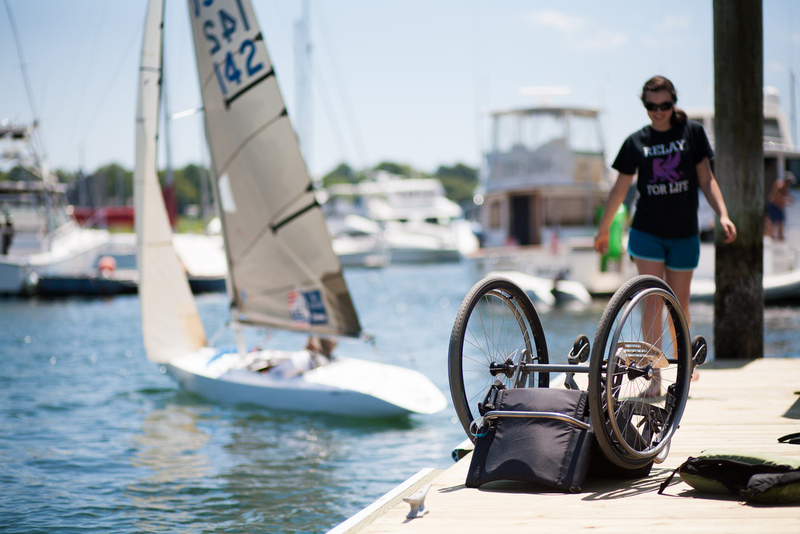 Known for it's coaching, race management and sailing locations and facilities, The Clagett offers adaptive sailors the opportunity to sail in fleet racing in Newport, and now with a partnership with Oakcliff Sailing in Oyster Bay NY sailors can now also take part in the Clagett/Oakcliff Match Race Regatta. The Clagett’s mission is to provide sailors with adaptive needs the opportunity to improve their skills and reach their personal goals through world-class coaching focused on Corinthian values. 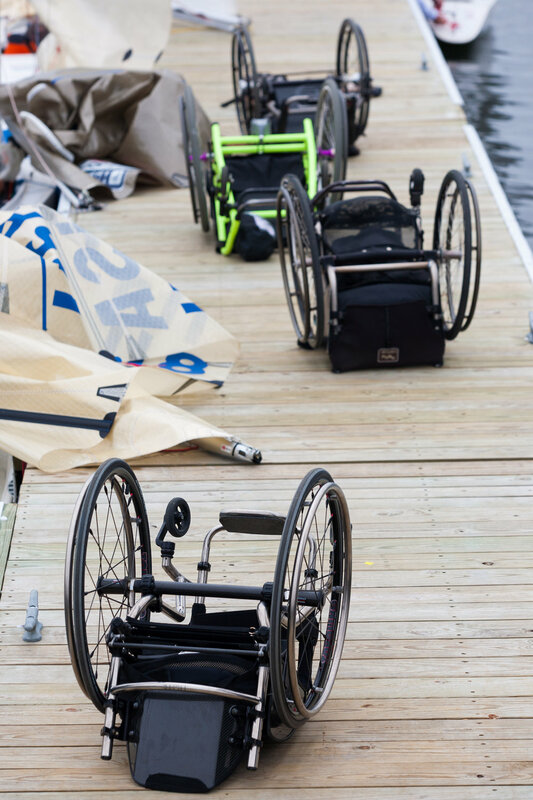 Open to both U.S. and foreign competitors, The Clagett is an integral part of the training for athletes with adaptive needs who are preparing for National and World Championship racing. Since the start of The Clagett in 2003, athletes have come from across the USA (19 states), Canada (4 Provinces), Israel, China, Ireland, Norway, Puerto Rico and St. Thomas, V.I. to take part in this world-renowned event.